Head down to the seafront between 1-4pm on Saturday 29 July and celebrate women in Science, Technology, Engineering, Mathematics and Medicine (STEMM) with Soapbox Science. 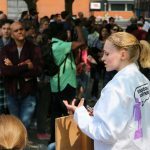 Soapbox Science hosts events across the UK and the world raising the profile of women in science – breaking down barriers and challenging stereotypes about who a researcher is. And they are coming to Brighton for the first time this summer. Chantal Nobs, a PhD student at the University of Brighton, was one of 12 women selected to participate in the Soapbox Science London event on London’s Southbank in 2016. Find out more about the Brighton event here. 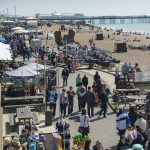 This entry was posted in Events, Life at Brighton, Research, Uncategorized. Hello and welcome to our blog for the University of Brighton computing division. On here you’ll find news about what our students and staff are doing. Leave us a comment and let us know what you think. Or let us know what you’d like to see more (or less) of.